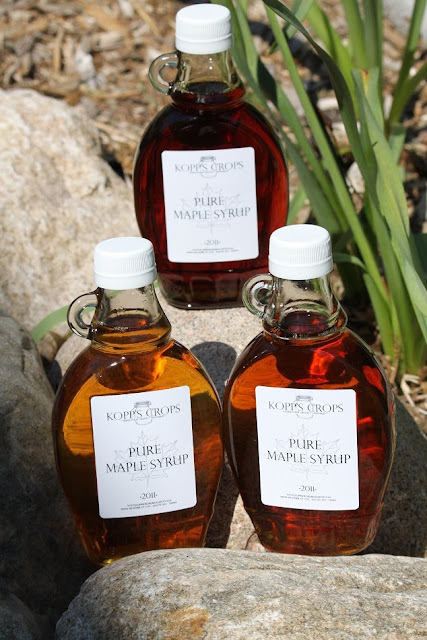 Kopp's Crops is a family-run business specializing in maple syrup, honey and fresh vegetables. We are located 45 miles north of Minneapolis in Bradford Township on our 65 acre farm. Local Orders: For pickup in Isanti, Cambridge, Brooklyn Park or Arden Hills, please email koppscrops@gmail.com or call 763-772-7057 to place your order and arrange payment & pickup. Available products are listed in the shopping cart below. Outside the Twin Cities: Please use the online shopping cart below. USPS shipping charges will be calculated at checkout. Well, the 2018 syrup season is upon us. Sort of, anyway. These two pictures pretty much sum up our season so far. Yes, that is a sap-cicle running all the way to the ground. This bucket full of sap, but is still more than half frozen, on April 8. Hello, Gorgeous! Thankfully we did get one good boil in before the latest cold snap. So we shall see. If the warmer weather doesn't some too high too fast, we should have another boil this coming weekend. If not, at least we've got a couple gallons in the bottle! It's that time again! Time for the Isanti County Unique Boutique & Antique Tour https://www.facebook.com/UniqueBoutiqueandAntiqueTour and your chance to stock up on Kopp's Crops honey and maple syrup. Once again we're selling at Brenda's Log Cabin, stop #8 in this year's brochure on the boutique Facebook page. Brenda's is closed on Sundays, so plan your visit for today through Saturday (Sept. 17), or next Thursday the 22nd-Saturday the 24th. While you're at it, make a full day of it and check out all the fun shops on the tour! If you miss the boutique but don't want to miss the sweetness of Kopp's Crops, please feel free to email us at koppscrops@gmail.com to order directly. 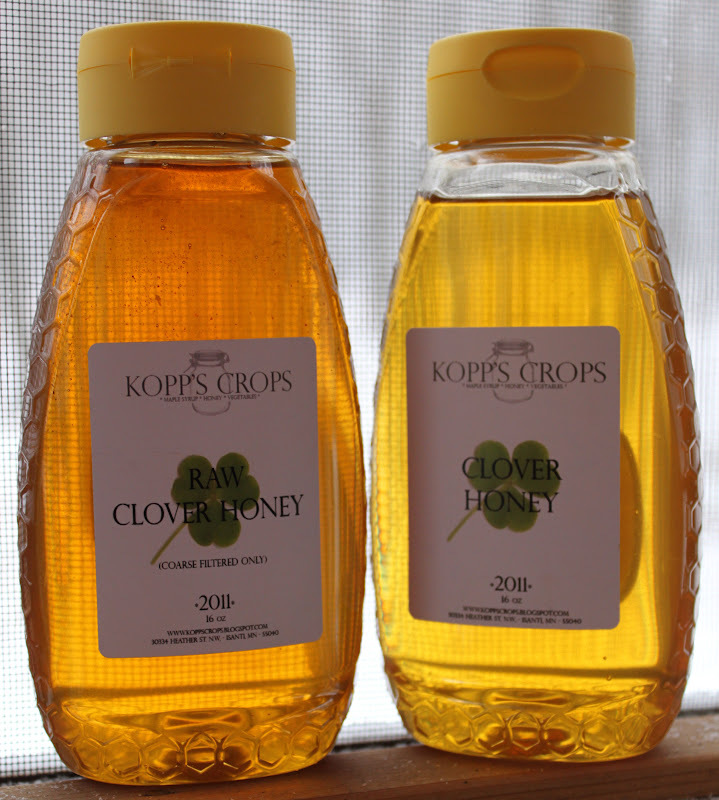 Kopp's Crops 2015 honey is here! The bees were very busy this summer, collecting the abundance of nectar generated by our not-so-dry summer. Now we've finally had a chance to extract the bounty (leaving enough to get our worker beesthrough the winter, of course), and bottle it up for all to enjoy. The maple trees also had a great year, so we still have 2015 maple syrup left, tool. Quite a nice product family portrait, don't you think? We haven't had a chance to update our ordering sidebar, so please ignore the drop-down boxes on the right. If you would like to order for pickup, USPS shipping or explore local delivery options, email us at koppscrops@gmail.com, or message us through our Facebook page. In the area this weekend? Look for both honey and maple syrup this Thur-Sat, 9am-5pm at Brenda's Log Cabin (440 319th Ave NE, Cambridge, MN), part of the Isanti County Unique Boutique & Antiques Tour (www.uniqueboutiqueandantiquestour.shutterfly.com). Ah, autumn in Minnesota. The leaves are beginning to change, there's a slight chill in the air, and Honeycrisp apples adorn market shelves. Time to replace those iced coffees with your favorite hot tea, sweetened with Kopp's Crops Honey! Ready to sweeten up your day with Kopp's Crops honey? Email us at koppscrops@gmail.com to pick up at our farm, ship via USPS, or explore Twin Cities area delivery options. In Isanti County this weekend? Look for us at Brenda's Log Cabin Thursday 9/25 - Saturday 9/27 on the Unique Boutique & Antiques Tour: https://www.facebook.com/UniqueBoutiqueandAntiqueTour. Maple Syrup for sale! Because of this spring's not-ideal-for-syrupping weather, it's another "Limited Edition" year for Kopp's Crops maple syrup. But if you like your syrup on the darker, stronger-flavor side, you'll love the few bottles we managed to squeak out! We're selling through Brenda's Log Cabin boutique on the Unique Boutique & Antiques Tour in Isanti County this weekend and next. Click on over to the Tour's Facebook Page here for a map and additional details. Brenda's Log Cabin is # 10 on the flyer - please note, she's closed Sundays. If you can't make it to the tour, email us at koppscrops@gmail.com to reserve your bottle today (please do not order via the website). Chances of a sell-out by the end of the month are high! Dear Minnesota: Do you want to be a serious maple syrup production state or not? Please decide, and deliver weather accordingly. With great haste. Sincerely, Kopp’s Crops and our fellow Minnesota Syrup Producers. A couple weeks ago we made our annual pilgrimage to Wisconsin for syrupping supplies. Then yesterday we tapped our first 75 trees, in the hope that the 10 day forecast holds true and we see some sap-loosening temperatures come our way. We had high hopes coming into 2014; last year we had our most prolific season ever. Granted, “ever” for us is only five years, but still – it was pretty awesome. Twenty gallons of golden goodness graced our boiling pan and filters. At 40 to 1 sap to syrup conversion, that means we collected, carted around, and cooked down around 800 gallons of sap. 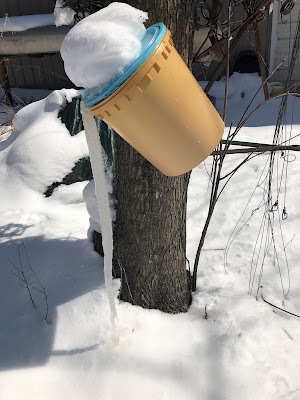 The perfect mix of warm days and below-freezing nights kept the sap moving so long that we stopped boiling before the sap ran dry. But 2012? A crazy week-long February heat wave took temperatures so far above freezing, even at night, that the sap went shooting for the treetops and never looked back. Same number of trees, barely a gallon of syrup. This photo of one of our frozen taps pretty much sums up the 2014 season so far. A couple of days with just enough warmth to get the sap moving, then BAM - another deep freeze. In a normal year, we’d be wrapping up the season in the next couple of weeks. This year, we’re just hoping, still hoping, the sap run starts before it ends. So what’s it going to be, Minnesota? A significant syrup season, or straight to summer? This past weekend, the Kopp family took in the joys of the Isanti County Fair. First stop: the open class displays, where county residents show off the products of their crafting, baking, artistry and gardening. Friends of ours took first place on some photography and vegetable categories - congratulations to Bridget & Dave! Then with great anticipation, we headed over to the canned goods, and were honored to see two blue ribbons dangling from our entries! Our mushrooms beat out a beef jerky competitor in the "Dried Miscellaneous" category, and our best Grade A light amber reigned victorious in Maple Syrup. Next year we'll aspire to the purple Grand Champion ribbon. Thank you, Isanti County Fair Board! Medium and Dark Amber has the traditional maple syrup taste with dark having a more prominent profile. *SOLD OUT UNTIL SUMMER 2013* If you would like to reserve honey for 2013, please let us know! 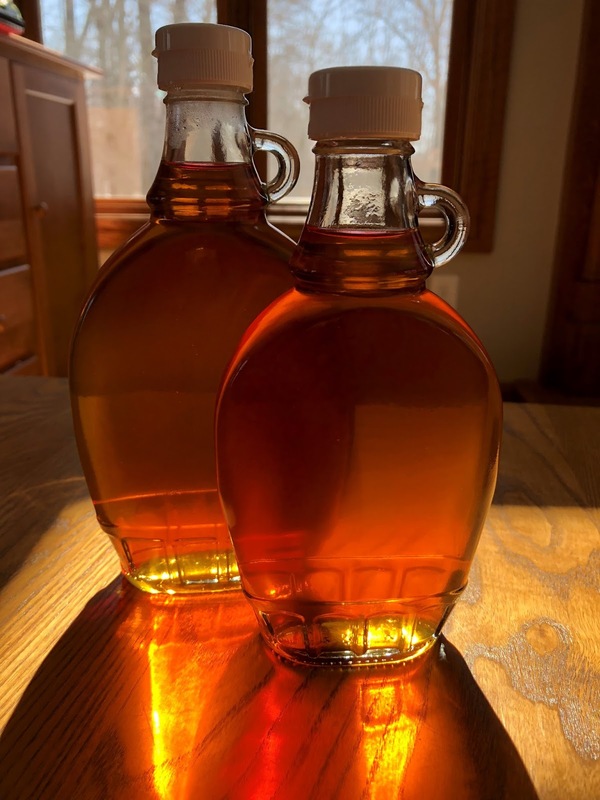 Maple Syrup Product Description: Made from the earliest sap of the season, Grade A Light Amber has a mild maple flavor that is perfect for foods like ice cream that don’t overpower the subtle flavor. Grade A Medium Amber comes from the middle of the season, and has a slightly stronger maple flavor that can hold its own with pancakes and waffles. Late-season Grade A Dark Amber has a deeper maple flavor that shines through in your favorite recipes. Honey Product Description: Each 1 pound container of honey is processed raw and has never been heated or pasteurized ensuring the natural health benefits remain in each bottle. The 2011 Spring Flower Honey is mainly black locust, dandelion and raspberry nectar which gives it a minty after taste while still holding on to the traditional honey flavor. The Clover Honey is from the main sweet white clover crop during mid-summer. It retains the traditional honey flavor.